"Use this delicious filling to fill cupcakes or your favorite layer cake. The microwave makes it fool-proof! Use different extracts to vary the flavor; almond and mint are both really good." 1Heat milk in microwave-safe glass or ceramic bowl in the microwave on high until hot but not boiling, 2 to 4 minutes. Combine sugar, flour, and salt together in a separate microwave-safe glass or ceramic bowl. Whisk hot milk into the sugar mixture gradually. Cook milk mixture in microwave on high in 1-minute intervals, stirring after each interval, until thickened, 4 to 5 minutes. 2Whisk eggs in a separate small bowl until pale and frothy. Whisk 1/3 cup of the milk mixture into eggs gradually, then whisk egg mixture into remaining milk mixture gradually until smooth custard forms. 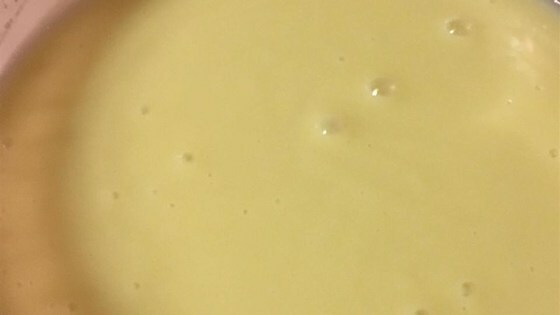 Heat custard in microwave on high until thickened, about 2 minutes more. Cool slightly; stir in vanilla extract. Chill custard in refrigerator until completely cooled, about 30 minutes.